With awful goaltending and their best player injured, the Boulder Flyers should be flirting with the middle of the pack. 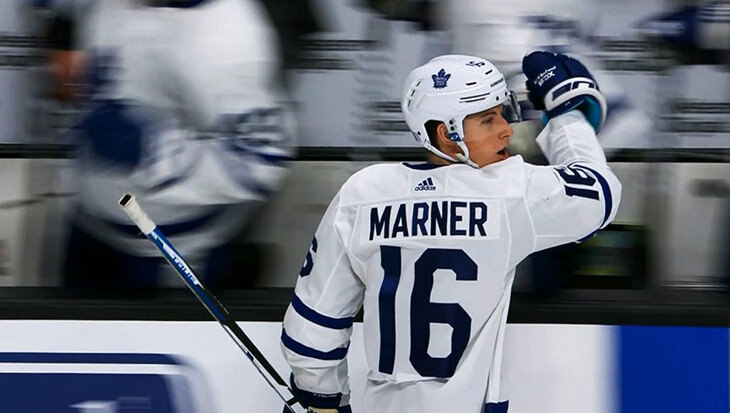 Instead the smoke-and-mirrors franchise moved into 1st place on Thursday, Mitch Marner (1g, 2a) guiding his team to the promised land, the Flyers currently 0.9 points better than the “say what! ?” Bluliners. Netting 9.0 points, the Central Red Army were okay on Thursday but the Boulder Flyers were okayer, GM Morgan’s squad now leading by 8.6 points with three days remaining in the week. One of the worst scores of the week isn’t doing GM Collard any favors, the (literally) waddling Wild Ducks slowly succumbing to Concussion Junction, GM Brendan’s no-longer-in-the-cellar team leading by 18.0 big ones. Fans were treated to an all-out brawl on Thursday. Badger Bob leveled the Polar Bears with a 17.0 point haymaker but the Bears would rise from the canvas, the team doubling-over the Bobs with a 19.0 point punch to the gut. At the end of Round 4 the judges have Badger Bob on top, leading this scheduled 7-round bout by 5.5. One week after posting the best score of the week, the schizophrenic Misconducts are holding the worst score of the week, a paltry 12.0 points leaving GM Smalley’s sputtering squad a distant 11.0 points behind the again-in-the-cellar Ice Cats. Very little separated the Bluliners and Ice Hogs on Thursday as GM Hamilton’s squad netted 8.0; the Hogs collecting 7.5. As such, very little has changed as both teams skate toward a six-game Friday. The Vegas Vipers are poised to put the kibosh on their four match losing streak, a strong 11.6 point performance seating GM Miller on a thin but still more comfortable than the floor 2.7 point cushion. Note: The Vipers updated score reflects a missed Mike Hoffman assist (1.0 point) from a game played on Tuesday.